Note the color coding for “languaging” of "full spectrum meaning" re: "dimensionality"
emerging Next Economy for Common Wealth. at the heart of a golden rule/law standard for global mass TeLeComm. five dimensional nature of full spectrum Conscience. 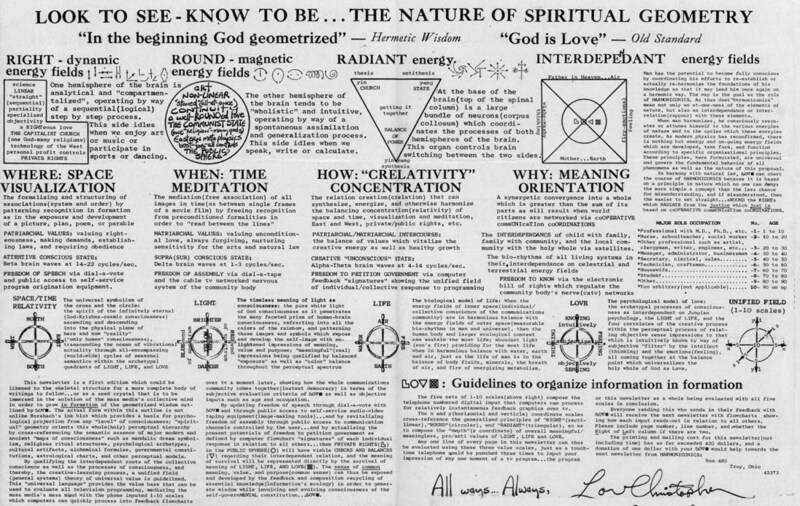 framing of the holographic principles can be seen in the "Power Shift Chart". Once you "get it"
wholeness for holistic healing of our social Conscience, and thereby, all our core institutions. as generalized in the on-line movie, "What the Bleep Do We Know!?". In other words, FAITH in the first principles for application of "universal law language"
the light of Conscience in our social networks… to “raise the bar"
social Conscience for the Family of Man in a global village. More light as Conscience raises the standard for civility to the "intuitive-knowing"
synergizing the best of both the left and right brain in East/West hemispheres. It's all connected in the hemispheres of the brain and of the Earth. This is why the Eastern mind, that is "right brain dominant"
is inscrutable to Western "left-brain dominance"
(reading left to write with letters & words). more transparent process for conscious evolution. culturing our social Conscience... THE GENESIS EFFECT. representing the "Language of the Angels of LOVE" (heart coherence). connected collective consciousness. These coordinates within the "Cosmic Cube"
for involving~evolving our individual and collective social network Conscience. descends into the physical "prism" of here and now (1st dimension). whereby the holy spirit of LOVE-in-action gives "discernment"
as Effective Sensory Perception for Conscious Evolution.